My Wine of the Week this week fits all the criteria that I have set myself. Great quality, great value for money and very, very drinkable. This week with autumnal weather creeping in – here in the UK anyway – I have gone for another red wine. I have never really been huge fan of Syrah in the past, I have enjoyed some of course, but I have never actively sought them out, but my taste seems to have changed over recent years and I am now seeing the delights that Syrah has to offer. Cortes de Cima from the air – photo courtesy of Cortes de Cima. Syrah of course comes from France’s Rhône Valley, chiefly the northern Rhône, where it makes the likes of Hermitage and Côte Rôtie. The grape has made other homes for itself too, Australia, where it is labelled as Shiraz for some reason which remains totally obscure, is the other really important place, but little pockets of production can be found all over the world. Chile, South Africa and California can all produce good examples, as increasingly does the Hawke’s Bay region of New Zealand and even Lebanon. The Cortes de Cima estate was created by Danish born winemaker Hans Kristian Jorgensen and his Californian wife Carrie – whose family was originally Portuguese. 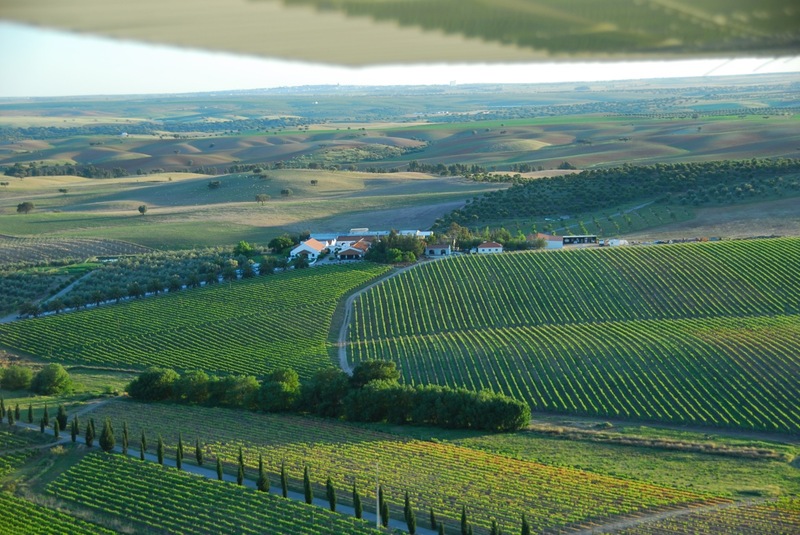 They were real pioneers settling into Portugal’s hot southern region of Alentejo at a time when people were generally leaving the land and few had noticed the regions potential for quality wine. They arrived in 1988 and steadily did the place up, renovating the buildings and installing electricity. In 1991 they started planting their vineyards and ignored all the local advice of sticking to traditional vines. Instead they decided to plant Syrah, the first people to do so in fact and their gut feeling that the grape would do well was vindicated when the first 2 vintages were extremely well received at the 1998 International Wine Challenge in London. Indeed they won the top medals for Portuguese wines that year. Because Syrah was not a traditional grape in the region the Jorgensens had to label their Syrah as humble Vinho Regional rather than DOC. What matters though is what is in the bottle rather than what is on the label and I think their Syrah is superb – as is everything else that I have tasted from the estate, including their inexpensive red Chaminé. The colour is a lovely intense opaque ruby red. Intensity is the byword for this wine. the aromas are of intense, bright fruit; redcurrants, raspberries, black cherry, blackcurrants and blackberries together with dashes of pepper, earth, coffee, smoke and mushrooms – you can smell the sunshine and the heat here. The palate is gloriously ripe, soft, opulent and lead by the fruit; red fruit and black fruit, all vibrant, ripe and juicy. There is also a seam of acidity running through the wine making it fresh and emphasizing that delicious juicy quality. Then there are some lovely firm, gently chalky, but seductive tannins on the finish that show this wine will age – if you want to keep it. Rich black fruit dominates the finish too together with espresso coffee, cracked black pepper and treacle from the 8 months oak ageing. A lot of wine and a lot of fun, drinking it instantly transports you to sunnier climes and it goes wonderfully with Mediterranean food – like lamb with rosemary – as well as richer, autumn and winter dishes – 89/100 points. Available in the UK from Waitrose for £11.49 per bottle. A list of worldwide distributors is available by clicking here. Do try this wine, it might open your eyes at to the quality that Portugal can produce.